November and December are a whirl of exhibitions, in addition to our project ‘Reconciliations’ exhibition. 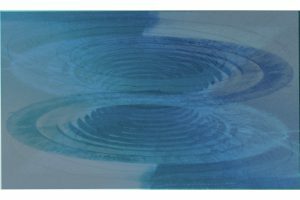 In November ‘harmonics & functions’ was selected for the ING Discerning Eye 2018 exhibition, at Mall Galleries, and ‘Vortextual Composition No. 6’ for ASC 40 Celsius, in the newly opened Croydon Art House. 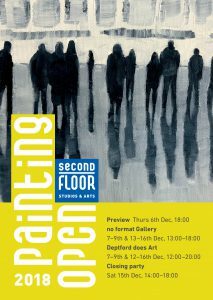 ‘Reconciliations VII’, a collage-painting piece, is showing in Second Floor Studios Painting Open, in Deptford, opening tomorrow. 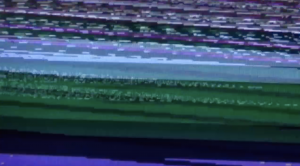 On Saturday, ‘Champ de Mars (Chant de Mars)’ is screening as part of Caroline Wiseman’s ‘Alive in the Universe’ art films (pre-Venice Biennale 2019), at Bermondsey Project Space. 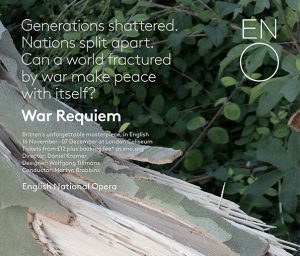 On 22 November 2018 I will be taking part in a pre-performance talk at the ENO with journalist Alexandra Coghlan; Martyn Brabbins, conductor and ENO Musical Director and Elaine Tyler-Hall, ENO staff director. I am looking forward to seeing and discussing this greatly, as it sounds excellent. 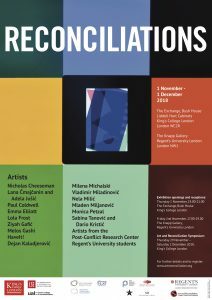 ‘Reconciliations’ is a two-part exhibition running in parallel at the Exchange, Bush House, King’s College London, and at the Knapp Gallery, Regent’s University London. 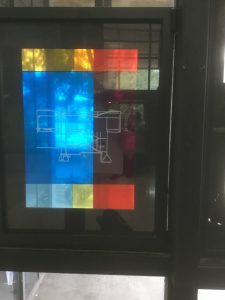 The exhibition offers a chance to see the specific project art commissions, as well as other works relating to the broader concept of ‘reconciliation’, and it also includes works created during a student print workshop held at the Knapp Gallery. 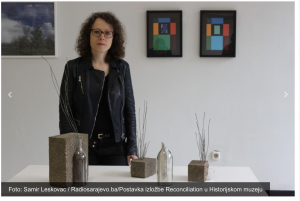 For this exhibition my Sarajevo works came back to London, and were displayed in a new way. 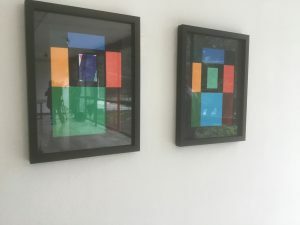 I also showed some older works, as well as some new pieces from the ‘Reconciliations’ series, this time based around photographs I had taken in June in Sarajevo of the broken stained glass at the History Museum. On 8th November Professor James Gow gave a presentation on ‘Reconciliation after War’, as part of a series of talks on reconciliation, at St. Mary Abbots Centre, Vicarage Gate, London. We decided that this would work best as a conversation, originally intended to be between him and Dr. Rachel Kerr, but unfortunately Rachel was unable to make it. I stepped in, and the conversation took a different turn than it might have with Rachel, perhaps slightly more art-based and personal, but it was certainly engagingly received and we had very positive responses. For me it was a very rewarding experience, as the audience was made up of a public which was diverse in many ways, and therefore the conversation with the audience covered a far wider range of life experiences and issues than it might have done in a more traditional university setting. It was refreshing to talk about our exhibitions with people who had no prior knowledge of the project. 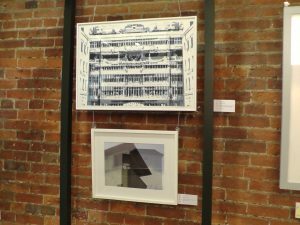 On 7th November I hosted a wonderful evening at the Exchange ‘Art and Reconciliation: A Conversation’, which involved 5 artists presenting their reconciliation-related work. Painter Gunther Herbst discussed his paintings practice in relation to South Africa, apartheid and modernism, looking at the effects of ‘displacement’ in relationship to visual representation. Dr. Lola Frost talked about how her painting practice engages with the tradition of sublime landscape painting, insofar as it delivers a critique of phallocentric interests through a reconfiguration of psychosexual differences. Filmmaker and artist Naresh Kaushal presented his new film about regeneration in East London. 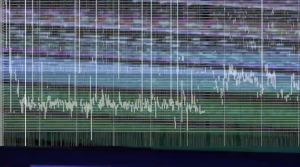 Artist Pam Skelton showed extracts from her video installation work in progress ‘Between Neighbours’, which imagines an exploration of what dialogue is in situations of war and conflict. 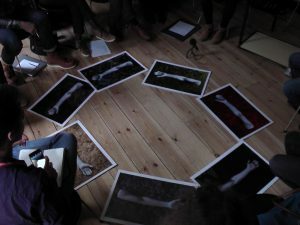 Sculptor Emma Elliott concluded by showing her concept video about her ‘Reconciliation’ project – a large marble sculpture of a man’s arm, with stigmata and an Auschwitz tattoo number, bringing together the Holocaust and the crucifixion of Jesus Christ – and reflects on the connection between atrocities past and present. The evening provoked a great deal of animated discussion across a wide range of topics. I created some sculptural pieces for the project’s ‘REconciliations’ exhibition at the History Museum of Sarajevo, in Bosnia and Hercegovina, in June 2018. I also showed some work which relates to the project, but had been made earlier. Alongside the exhibition, we also arranged a symposium and various workshops and events. It was a great privilege to meet so many local and international artists, and to get a chance to work with the museum and its staff. 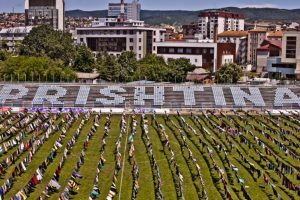 ‘Safe Water for Sarajevo’ is a line from an article in the New York Times about the provision of clean water to homes during the siege of Sarajevo, in which ‘safe’ refers to the purity of the water, but also to not having to dodge snipers. 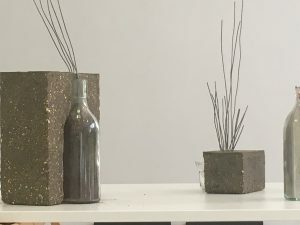 In this installation, the crumbling concrete, protruding wires and broken glass allude to architectural ruins, while at the same time the glasses and bottles suggest a domestic setting for socialising — all made impossible. This series of prints and collage/drawings is an ongoing series. 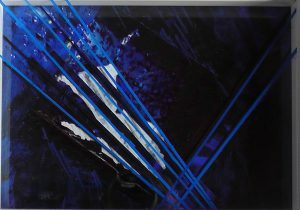 ‘Reconciliations I’ and ‘Reconciliations II’ were created before the exhibition, by photographing layers of illuminated coloured acetate. The prints reveal the effects of juxtaposition, of superimposition, of light and dark, translucency and opacity. In doing so they suggest a kind of conversation (whether between the material, colour and light, or between individuals, or communities), as well as echoing stained glass window memorials. 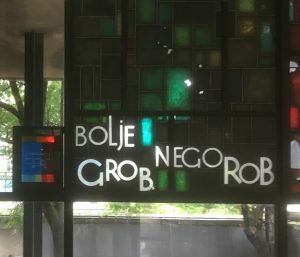 ‘Reconciliations III’ is created as a dialogue with the History Museum of Bosnia and Hercegovina, Sarajevo – specifically with the centrepiece in the entrance, the stained glass artwork by Vojo Dimitrijević. 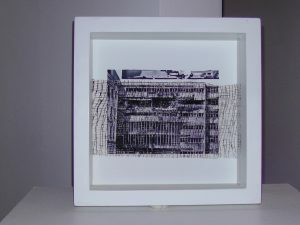 My work features an abstracted drawing from an architectural plan of the Museum, on acetate collage. 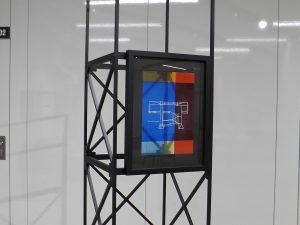 It is a direct piece, not being a photograph of acetate but the actual, acetate itself, and during the exhibition it was installed next to Dimitrijević’s war-ravaged glass. 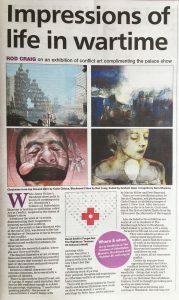 ‘Reconciliations III’ returned to London for our ‘Reconciliations’ exhibition at the Exchange, Bush House, November – December, but will then go back to be part of the permanent collection at the History Museum in Sarajevo, I am thrilled to say. This work has been selected for ‘DOORWAYS’, part of the 2018 FaB Festival in Bath. The exhibition is curated by Mike & Dona Bradley; 25 May – 10 June at 7 New Bond Street Place, Bath. The title ‘Abandon all hope’ refers to the phrase ‘Abandon all hope, ye who enter here’, which Dante places at the gates to hell in Canto III of his ‘Divine Comedy’. In the epic poem, hell is a realm full of those who have given in to the temptation to commit evil, such as brutal violence, or acts of malice, towards others. I took this photograph of the doorway to the Pathology Block at Sachsenhausen Concentration Camp in Germany. The camp was built in 1936 and was designed and planned by SS architects to be the ‘ideal’ camp, intended to express their world view through its architecture. Between 1936 and 1945, more than 200,000 people were imprisoned in Sachsenhausen. The doorway to the Pathology Block is built above the Mortuary Cellar, which was used to house bodies prior to cremation. 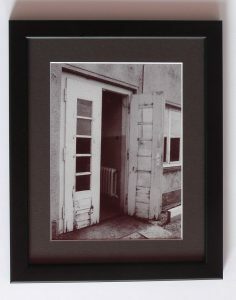 The dilapidated state of the wooden doorway is emphasized in my work by the halftone print technique I have used. The loss of detail in the image relates to the loss of information – it is impossible to know what evil lay beyond this doorway, or even where the door itself is located, without further explanation. The doors in the image are casually open, allowing contemporary visitors to the camp to see inside, and even step inside, whereas during the time of their original use their opening and closing would have been extremely controlled. This doorway was the threshold to inconceivable horrors, yet now, and out of context, it looks banal and commonplace. An innocuous title to this work would have obscured further what it actually represents. 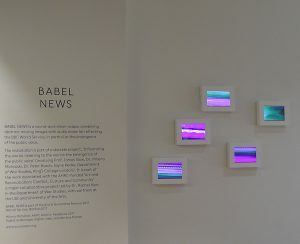 BABEL NEWS was the first artwork (along with photographs by Bogdan Frymorgan) to be exhibited in the newly opened Arcade Space at Bush House, in 2017. 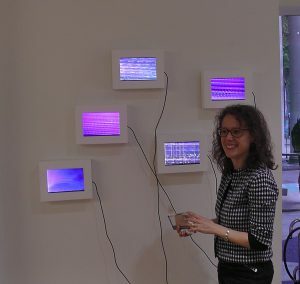 It was a real privilege to have my installation there. BABEL NEWS was commissioned as part of the 2017 Arts & Humanities Festival, on the theme of ‘World Service’. This idea was interpreted both broadly conceptually, and literally, in terms of the BBC World Service. It formed part of a broader project ‘Influencing the World, Listening to the World: the Emergence of the Public Voice’, which included a panel discussion about how wars and major international issues are presented and discussed, the language used, and themes such as propaganda, spin and fake news that communicate these issues. The panel included Emily Kasriel, BBC World Service, Professor Sir Lawrence Freedman, King’s College London, Dr. Nicholas Michelsen, King’s College London, Professor Marie Gillespie, Open University, and Dr. Neville Bolt, Editor-in-Chief Defence Strategic Communications. 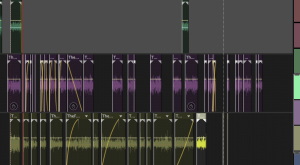 These have been overlaid, and volumes altered, to weave a tapestry of voices which are sometimes clearly audible, with distinct phrases standing out, yet which, at other times, merge into an indecipherable babble of sound. In terms of the visual, too, there are multiple layers, which merge at times to form a complex surface, and at others reveal themselves clearly as a single image. 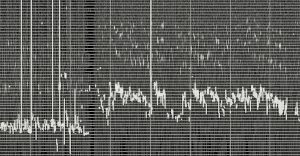 These include images of digital sound waves, analogue television glitches, drawn-on photographs and more. 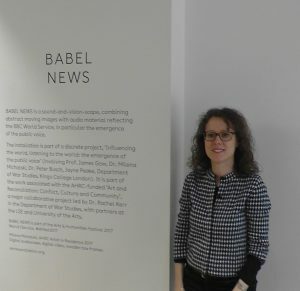 BABEL NEWS was supposed to come down at then of the Festival, but it worked so well in the space that the King’s Cultural Institute decided to keep it in place as long as possible, until the end of January 2018. Gunther Herbst: a painter who works with ideas around memory, memorialisation and monuments in South Africa. 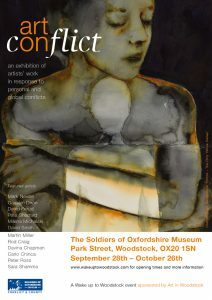 I was invited to exhibit in this international group show on conflict because of my work on war crimes sites and other political and military conflicts, but l was keen be part of it specifically because I was interested in its broader understanding of ‘conflict’ – as something which can be between individuals, between communities or countries, for example, but also as something internal, within an individual, and specifically here, within the artist. This fits precisely with my own thinking in the context of our ‘Art & Reconciliation’ project, where I am also considering issues of reconciliation within oneself, as well as within communities, and again – with specific reference to the arts. 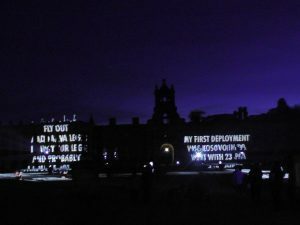 ‘Art on Conflict’ took place in the ‘Soldiers of Oxfordshire Museum’, as part of the Wake up to Woodstock Festival, curated to complement and reflect the themes of power, conflict and activism in Jenny Holzer’s show and night time projection at Blenheim Palace, ‘Softer’. 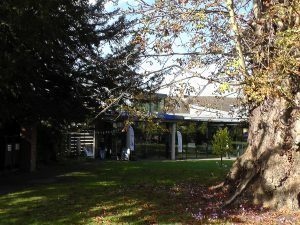 The museum, which is very near the Palace, in a lovely, leafy setting, is small but rich in content, and a real pleasure to show in, thanks to Dennis Allen, Rod Craig and Jenny Kelly. 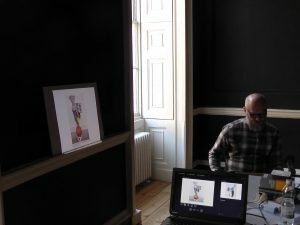 I showed 4 separate works, spanning from 2012 to 2017, including a new iteration of my ongoing sculptural installation series, ‘Two Towers’, as well as a unique print loaned by King’s College London, ‘Scene/Unseen’. All the works in the exhibition were selected ‘to reflect artistic, personal and historical conflicts’, including very recent ones, as in the powerful and imposing pieces by the Syrian painter, Sara Shamma. 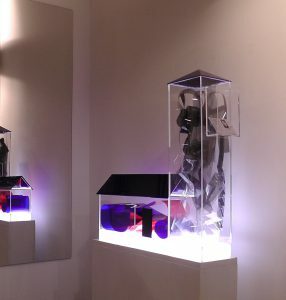 I specifically chose a place right by the mirror for my transparent and translucent sculptural installation, ‘Two Towers Talk’, as it introduced an additional reflective facet to its element of light play. For me, one of the highlights of this exhibition was ‘Waterproof’, a beautiful film by and about Graham Dean’s paintings and processes. It is his painting that was used on the exhibition poster. 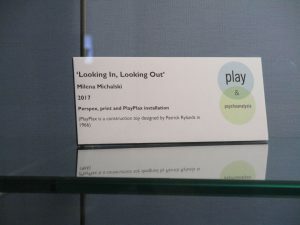 My installation ‘Looking In, Looking Out’ comprises three parts: two prints and a sculptural, perspex piece incorporating print within it. The installation treats issues of home and exile, of protection and threat, of visibility and invisibility. It relates both to Anna Freud (and Sigmund Freud) as a refugee, and to my own family history, and by extension to general issues of home, flight, exile, refuge, and questions of reconciliation between past, present and future. The overall theme of the exhibition was ‘Anna Freud and Play’, so for this piece I created an iteration of my ongoing series of acrylic architectural constructions, this time incorporating pieces of the children’s classic building toy ‘PlayPlax’, designed by Patrick Rylands in 1966. 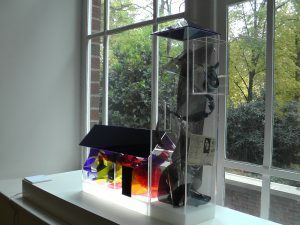 Like my construction, ‘PlayPlax’ is made of transparent or translucent Perspex. The two accompanying, yet discrete, prints, ’Duality’ and ‘Looking In, Looking Out’, each interweave two places, times and themes. 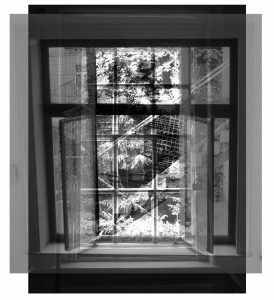 Both are created by superimposing two photographs, in one doors, in the other windows, in the Freud family house. One set of doors and windows is at Berggasse 19, Vienna, Austria, where Freud lived and worked from 1891 until 1938, when he and his family were forced into exile by the National Socialists. The second sets are at 20, Maresfield Gardens, London, UK, where the family fled to, and which remained the family home until Anna Freud, the youngest daughter, died in 1982. 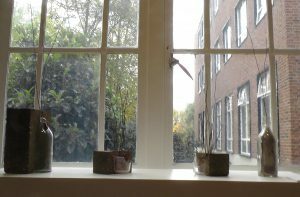 Both Sigmund and Anna Freud worked here too. 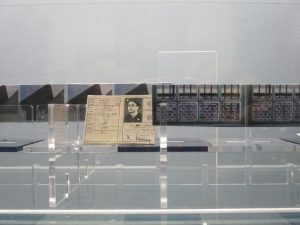 This exhibition is part of the ongoing ‘Ruins of Time’ series of exhibitions, part of the London-Munich exchange. 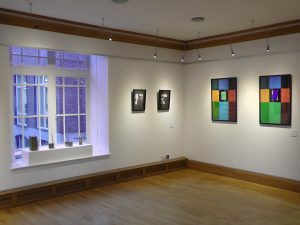 The three works showing at Asylum – ‘Disintegrating’, ‘Unveiled’ and ‘Abandoned’ – were created specifically for the site. The over-arching theme is the concept of ‘asylum’, in all its meanings, and, inherent within it, its opposite. 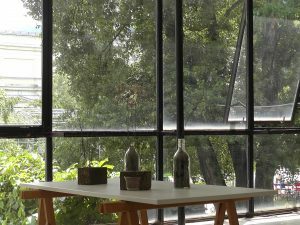 These works are an attempt to reconcile the building’s past uses and fate during the war with its current functions as an arts venue, amongst other uses. 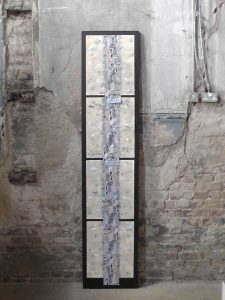 On the simplest level, the works refer to the fabric of the former chapel itself, in its captivating state of partial decay. This is both a reflection on time passing, life and death, and a reference to the chapel having been part of a place of retirement, worship and funerals for ‘decayed members’ of the victuallers trade. On another level, it references the bomb damage dating from the second world war, which destroyed the roof and left the stained glass windows broken in places. 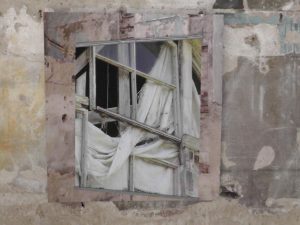 The three works all focus on architectural elements, whether a rotting plain window and disintegrating wall, a smashed, coloured, stained glass window or fragments of plaster and paint. These parts of a building are pitifully inadequate at providing any protection, as they were originally intended to do; they have become decorative yet disturbing, reminders of times, places and people long since gone. They function only as metaphors. 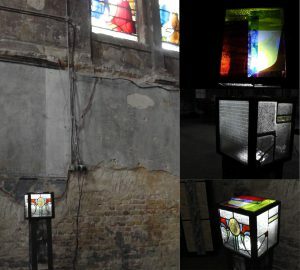 These works created for Asylum amplify these ideas further, by alluding to the chapel’s physical decrepitude, and the adoption of the site as a venue in which its functional failures have become aesthetic ‘assets’.